The Vancouver Condo Buzz » Achievable Home Ownership at 188 Keefer Vancouver Condos! 1 Bedrooms from $239,900 plus 2 Beds from $399,900! Achievable Home Ownership at 188 Keefer Vancouver Condos! 1 Bedrooms from $239,900 plus 2 Beds from $399,900! 188 Keefer Vancouver Affordable Condos Are Here! Achievable home ownership in Vancouver is now here! The 188 Keefer Vancouver affordable condos present a unique and quite fascinating opportunity for first time homebuyers, purchasers who want to live close to everything in downtown and buyers who want to live in a walkable neighbourhood close to transit routes. Through the collaboration of one of the strongest development teams we’ve seen in the Vancouver real estate market place, 188 Keefer condos are brought to us by Westbank Developers and marketed by Magnum Projects. The best rates and mortgage advice comes from Vancity and the fabulous architecture is by award winning W.T. Leung Architects. Together, Vancouver home ownership is achievable in the most historic and up-and-coming communities in downtown: Chinatown. 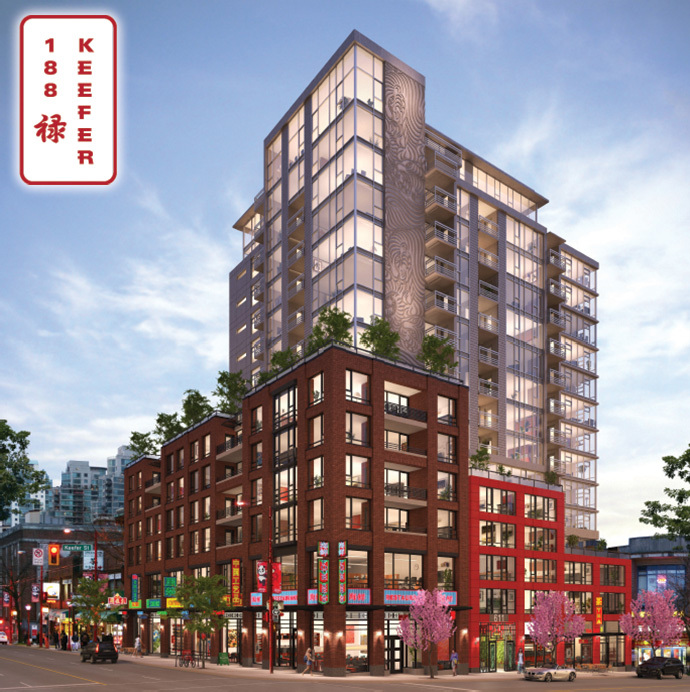 Always noted for being North America’s second largest Chinatown, Vancouver’s Chinatown now welcomes 188 Keefer condos, a striking mid-rise tower located in a historic community close to local grocers, great dining, Gastown and the False Creek Seawall. Following the highly successful 60. W. Cordova project, Westbank embarks on their latest high quality opportunity at 188 Keefer Vancouver affordable condos. The tag line as mentioned above is “Achievable home ownership in Vancouver is now here!” This is very true as home buyers are only expected to put down 5% deposit with 1 bedroom suites starting from just $239,900. These represent the most affordable downtown Vancouver condo in the presales market today. In addition, the presale 188 Keefer Vancouver condos also feature 2 bedroom homes and the achievable cost of ownership starts from just $399,900! 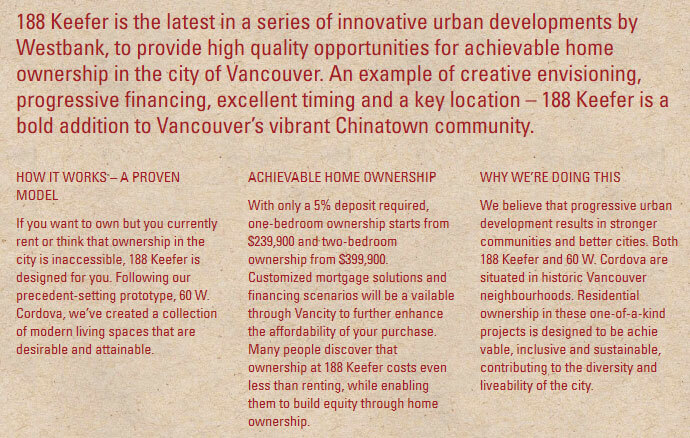 Vancity further provides a more achievable home ownership model at 188 Keefer Chinatown with customized mortgage solutions and finance packaging that makes sense for you both short and long term. Westbank certainly delivers on a few fronts with this project: a key location that is walkable to everything, excellent timing for those who want to purchase a brand new apartment at bargain basement mortgage rates and creative envisioning with stunning architecture that fits perfectly into the historic Chinatown Vancouver real estate district. We believe that these 3 factors will make 188 Keefer Vancouver affordable condos the most interesting and fastest selling project of 2013. On the Upper Levels 10 through 21 at the Chinatown Vancouver 188 Keefer Condos, achievable home ownership in Vancouver looks luxurious! The homes will include the same GE vented washer and dryer and sleek privacy roller shades on all windows. But the hardwood floors in the main living areas will be engineered wood in light oak or walnut. In addition, the stainless steel appliance set will include high-end Miele convection wall oven, gas cooktop (four burner), hood fan as well as a Panasonic microwave and Blomberg integrated dishwasher and fridge/freezer. 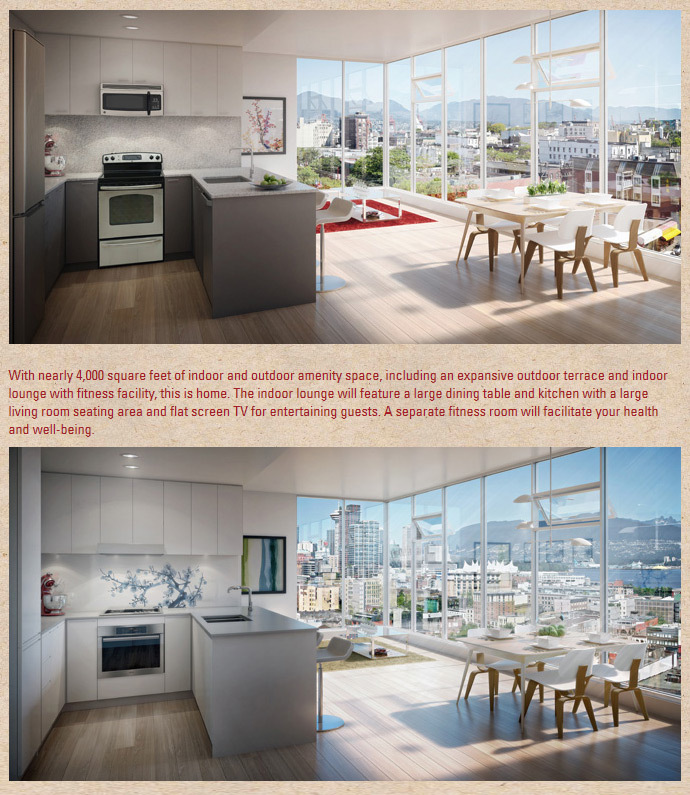 188 Keefer Amenities > Achievable Vancouver home ownership is now here! In addition to all the fabulous high-end interior features and specifications, achievable Vancouver home ownership here also comes with many perks. Centrally located in Chinatown, you have extremely close access to downtown Vancouver, Gastown, Crosstown and South East False Creek. Also within walking distance from the new Vancouver 188 Keefer affordable condos is the Entertainment District as well as the water. Live near the highly acclaimed Dr. Sun Yat Sen Garden and Andy Livingstone Park, or take a walk to get to numerous shops, eclectic boutiques and international cuisine. 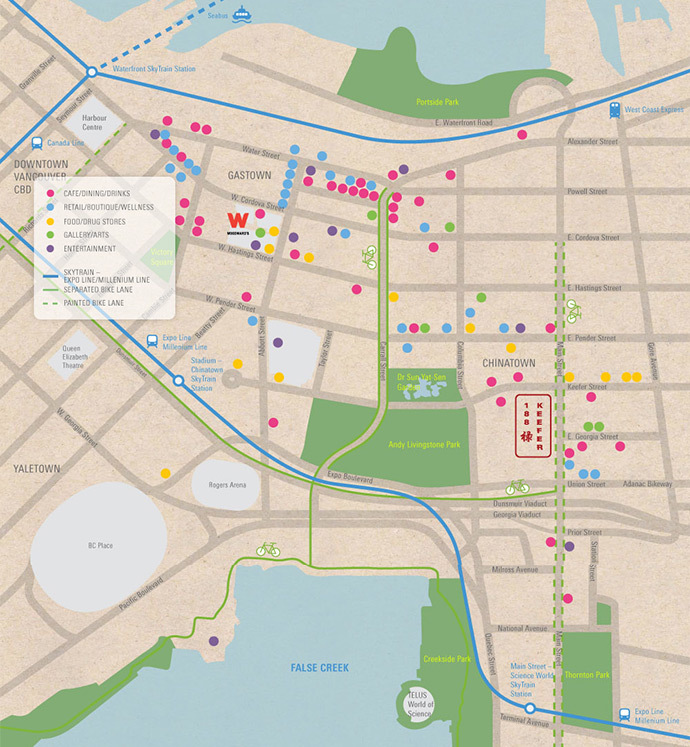 Close by is the SkyTrain Station as well as many gallery and arts/entertainment venues. With the eventual re-routing of the viaducts, 188 Keefer Vancouver affordable condos will give you an awesome opportunity to get into a brand new but historic neighbourhood. In addition, achievable Vancouver home ownership also comes with nearly 4,000 square feet of both outdoor and indoor amenity spaces for 188 Keefer condo residents to enjoy year round. From the expansive outdoor terrace deck to the indoor clubhouse lounge and fitness facility, this is what you call amazingly achievable Vancouver urban living. Inside you will also find a large dining table and kitchen for entertaining as well as a living room seating area with a large screen TV. If you are looking for an affordable Vancouver condo that is brand new and well located, check out 188 Keefer by Westbank at www.188keefer.com today! 188 KEEFER is the latest in a series of innovative urban developments by Westbank to provide high quality opportunities for achievable home ownership in the city of Vancouver. Following our precedent-setting prototype, 60 W. Cordova, we’ve created a collection of modern living spaces that are desirable and attainable. With only a 5% deposit required*, one bedroom home ownership starts from $239,900 and two home bedroom ownership from $399,900. Customized mortgage solutions and financing scenarios will be available to further enhance the affordability of your purchase. An example of creative envisioning, progressive financing, excellent timing and a key location – 188 KEEFER is a bold addition to Vancouver’s vibrant Chinatown community. The 188 Keefer Information Centre is located at 190 Keefer Street, Vancouver.